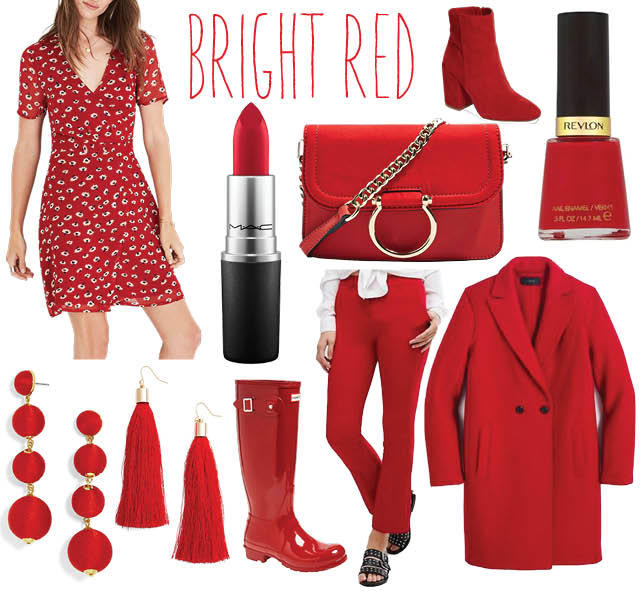 Whether you've watched the runway shows or just picked up a few fall fashion magazines you've probably seen that red on red on red is taking over this season. Personally, I love the color, but I do understand the hesitation to go out in head-to-toe red. Just like all colors red comes in many different variations. Going head-to-toe red means you can mix and match your shades like this Victoria Beckham look or you can go monochrome à la Givenchy. So if you want to go all out and try an all red look, add a few accessories to your wardrobe in the season's hottest color, or just dip your toe into the trend with a red lip or classic manicure, I've found some of my favorite pieces in four of the main reds you'll see in stores! Bright red is the the classic apple red, the chic red lip we all search for, the color my mom has painted her nails for as long as I can remember (I've linked her favorite shade). This red is a color so many people can wear, but is bright enough to really make a statement. If you don't want to spend a ton of money on a trend this is a safe color to pick up some classic pieces in. 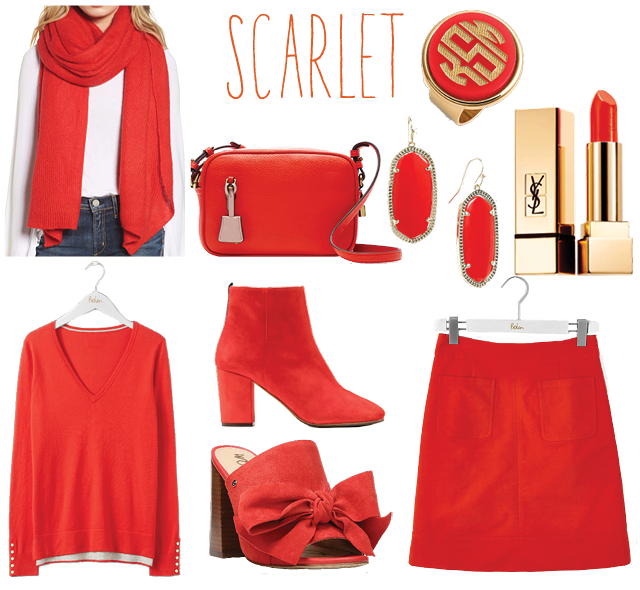 The bright red won't really over go out and you can always enjoy a red cashmere sweater around the holidays. Scarlet is a much more vibrant color with a bit of orange mixed in. This color isn't something I normally gravitate towards, but these pieces are all something I would love to add to my closet. In fact, I've considered picking up the three pieces from Boden to really try the head-to-toe look. If you really want to go monochrome, I reccommend picking up all the pieces from the same brand to ensure that the reds are super close. Pairing three pieces that are slightly off looks like a mistake. You can totally wear a darker red from down below with one of these two lighter shades, though, if you want to spread the wealth! 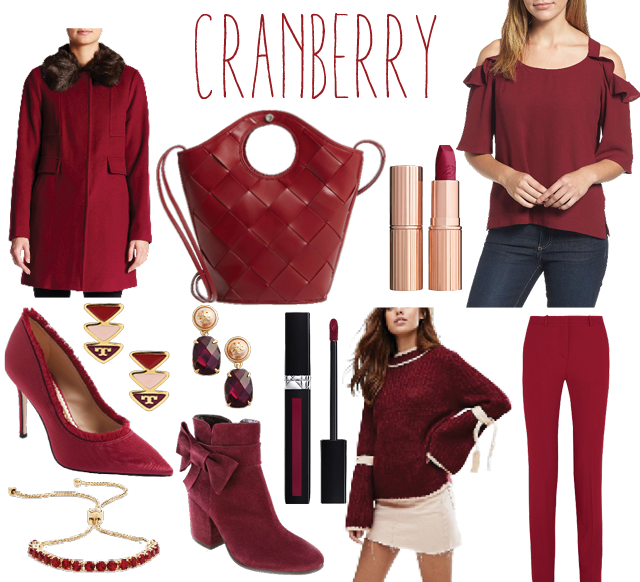 Enter my all time favorite shade of red: Cranberry! This is a darker red with a pink undertone. It's universally flattering and just screams fall. It's the color of the deepest red fall leaves. There are quite a few pieces in my closet in this shade already, but I might be adding a few more this season (totally adding this sweater, while it's on sale)! This is the shade that I will spend a little more on because I know I will wear it year after year. I mean those Sam Edelman pumps are kind of must for cropped denim and a chunky sweater. 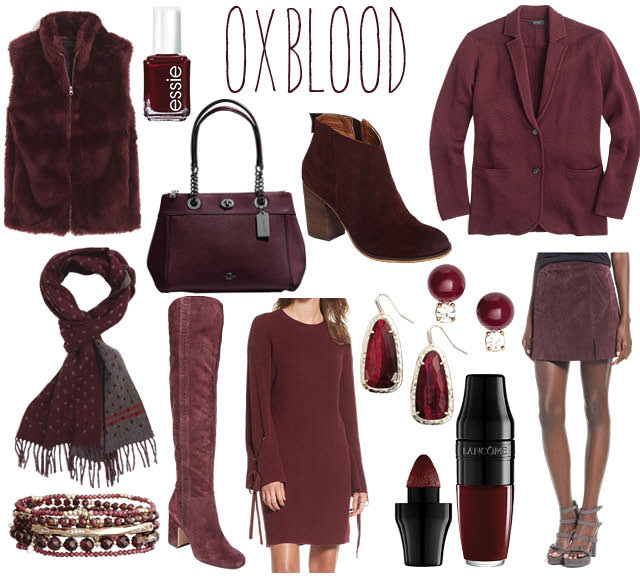 Oxblood has been a popular shade for a few FW season now. If you've never worn red or aren't sure about the color on you, purchase something in this shade. It's a dark enough color that you won't feel like a walking stop sign and it can basically be worn as a neutral. Pair this blazer with a striped tee under it or this skirt (keep an eye on it to come back in stock in your size) with a pale pink sweater for another take on the red-tone look. Are you planning to try out an all-red look this season? I'd love to see it! Great Fall Finds from Target! I was with my mom a few weeks ago in Oklahoma City. We were there for a wedding and ended up having to make a Target trip to pick up a few essentials that we forgot (I needed nail polish, ok!). Of course, because it's Target we ended up leaving with a whole basket of stuff that I then had to fit into my suitcase for the flight home. 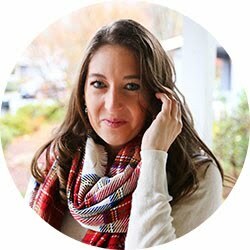 One of those amazing finds was this Boyfriend Blazer that I am in love with and this cute, cozy wrap which will look so great with my Stuart Weitzman Highland boots! I will also probably go back for this cropped olive jacket! One of the coolest thing about this line is that it's super inclusive and most of the looks come in plus sizes, so everyone can take advantage of these awesome look-a-likes! Of course, these Target pieces aren't the highest quality, but to get all of these pieces for under $50 it's a great way to add some trendy pieces to your closet! The Boyfriend Blazer: I've fallen in love with the look of a boyfriend blazer, black jeans and Chelsea boots. There are some super expensive versions out there (hello, Stella McCartney), but for a tenth of the price of the super popular Anine Bing version this is a great option. I bought it in a size 12 so it would be really oversized. I plan to push up the sleeves for a more casual look. I love that even though there's a red stripe running through it you can wear it as a neutral and layer it with almost any top in your collection. The Tweed Coat: I have been lusting after this Ted Baker coat all season! However, I can't justify spending $600 on a coat when I live in Texas. There just aren't enough cold days to really enjoy this beautiful piece! Also, for that much money I would rather invest in a neutral color that will never go out. (It's still on my wish list, though!) So, this coat isn't a one-to-one dupe, but when I walked up on it in the store I immediately thought of the Ted Baker style. The colors are similar and so great for fall. It's unlined, but maybe that's better for the mild winter months ahead. Either way, you can get a very similar look with this cute tweed coat! I bought a small and it's just a tad oversized, but I might keep my eye out for a medium to get even more of that overcoat effect. The Wax Jacket: I own this Barbour coat and it's one of the best investment pieces I've ever purchased. The Fall and Winter runways showed a lot of classic Americana looks and while Barbour is technically a quintessential British brand, if you throw this jacket on with your favorite jeans, a pair of rain boots and a cozy scarf you have best apple picking outfit ever! It's amazing that A New Day has a much cheaper option on the market now. Real wax coats take a lot of maintenance and I bet the Target version is a lot easier to maintain. It comes in a few colors, but my navy jacket has never let me down. The Black Booties: Once again these aren't as good of a dupe as I'd like, but they are basically the baby of a Stuart Weitzman Grandiose boots and the super popular pearl-heeled style. Obviously, for under $40 these A New Day booties aren't real leather, but the chunky heel and crystal embellishments will ensure that you're hitting two big shoe trends this season. Also, the star-like pattern on the heel screams "celestial" which basically is the biggest print trend right now and appeared on multiple runways, including Dior. I haven't tried them on, so the comfort level is unknown, but they're dying to be worn to your holiday parties! The Satchel: If you have the budget and you're looking to add a black bag to your collection I wouldn't hesitate to grab this one. It's a lot cheaper than some of the higher end designers, but the shape is classic and the mixed materials make it look so luxe. However, for $38 you can get the same shape, plus add the snake-skin look and a gorgeous color! I have a Kate Spade Croco bag that I bought a few years ago and I was worried it would be hard to carry because of the color, but I break it out every fall and winter. You can instantly elevate an outfit by adding a colored bag. Plus, I love both of these because you can wear it as a crossbody or carry it by the top handles for a more classic look. Not that you needed any more of an excuse to give Target all of your money, but this new line makes it even more tempting! We're a week and a half into October and I'm officially craving fall weather. Now that I'm in Texas (spoiler to a later life update post) it's still way too hot to dive into my boxes of sweaters, but these pieces are totally inspiring my fall wardrobe planning. This season embellished sweaters are a huge trend. Whether you go for something embroidered or covered in patches or pick out something more simple with a bell sleeve, you'll be cozy and on trend. I actually picked up this Free People striped sweater from Nordstrom Rack to wear with my black leather trousers and maybe even with a suede skirt. I love the color combination! Also, it's selling for $98 elsewhere on the internet, so check to see if Nordstrom Rack has your size! All of these sweaters would look equally fashionable with a pair of pants or in a skirt if you're in a warmer climate like me! I'm also considering trying to DIY something similar to this Zara sweater! It's kind of pricey, but maybe we can make one and save a little money. The layered dress look is so 60's and I am completely smitten. I purchased this black lace up dress and a white lace top to wear underneath it and I can't wait for them to get here in the mail! I plan to pair them with these black sock booties, so check out the blog for that look soon. Also, on my shopping list is this Free People Sweater dress and suede dress. Pair any of these with a pair of booties and you'll look all kinds of fall without being too warm. I will be filming a fall shoe haul soon and you'll see both the black sock booties and leopard print booties, but because I'm a shoeaholic I desperately want all of these styles in my closet. When shopping this season, look for shoes that have a little embellishment to them. Like the sweater trend, footwear this season is anything but boring! And lastly, the quickest way to make an outfit more exciting is to throw on a pair of statement earrings. Keep the rest of your outfit simple with a suede skirt, a cream sweater with ruffled sleeves and any of these earrings for a super cute fall look. I tend to skip all other jewelry when I wear earrings this big, but if you love your accessories, stick to bracelets and rings. Leave the necklaces at home and let your earrings shine! I wanted these J. Crew hoops all summer when they were released in a brighter color combination and I am so happy they've been re-released in a fall color scheme! What fashion pieces are inspiring you this season?